« The coulis (tomato sauce) I forgot. It rained a couple of nights ago and the morning after–a steady persistant rain that soaked the earth without flooding it–the countryside is absorbing it thankfully. The emerging sunflowers were struggling with the drought but already look greener and happier. 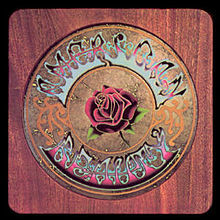 —a studio album the Grateful Dead recorded in the early Seventies. “..at that time, my dad was dying of cancer, and I would drive out to visit with him at the nursing home and on the way out there I would practice singing the song. I sort of identified that song with my dad and his approaching death. The lyrics Bob (Robert Hunter) produced were so apt, so perfect. It was very moving for me during the period of my dad’s passing. I felt like singing it in other situations similar to that since then. Nothing to do with rainfall after all–“but me and the sunflowers” are “grateful” anyway! I wonder if it is possible to buy a copy? maybe on disc now. Will check it out and see if it is still available.